Getting ready for the big day? These proposals are sure to spark a "Yes!" After you’ve gotten the ring out of the way, the trickiest part of a marriage proposal is probably deciding where and how to do it and in the sneakiest way possible. The element of surprise, location, and/or method all play a huge role in ensuring an overjoyed “yes” to your four worded question, so you want to choose wisely! Taking your partner to a place that she’s been longing to visit and proposing to her there is guaranteed to bring tears of joy. Whether it be on a private resort beach or beneath the Eiffel Tower, vacationing is a great way to catch her off guard while giving her truly treasurable memories. If you want to make the ultimate sweet guy move, going back to the spot where you both shared your very first date will be nothing short of smiles, appreciate, and a definite yes. Unless it’s the kind of first date you both like to frequent, make sure to set it up in a very casual way in case your partner gets dubious of your randomly thoughtful request. If you know your dog (or cat) is trained to balance an engagement ring on the snout or at the top of his or her head, then this method will work out in your favor as well as your significant other. 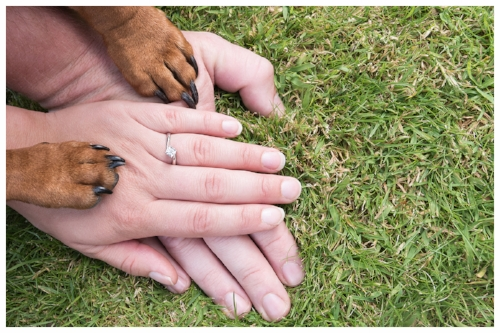 This is probably a common way to pop the question on social media as there are many adorable images and footage of pets lending a helping a paw. You could also even surprise your loved one with a new puppy or kitten along with the ring for a moment she can’t say no to. For those who like to keep it simple and sweet, but also want a scenic view for getting down on one knee, look no further than a casual stroll in the park. A park as iconic as Central Park is especially known for proposals that’ll make your partner feel like she’s in a romantic movie scene. Show her that you really want to spend the rest of your life with her by writing your love in the sky. 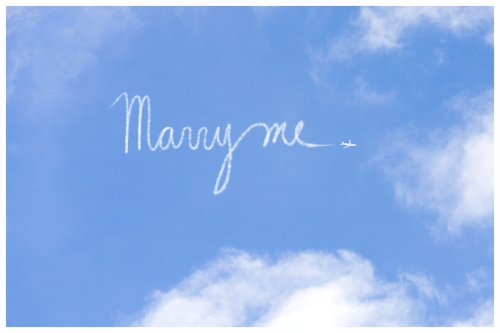 Hiring a skywriter may be considered one of the tried-and-true proposal methods, and perhaps the more extravagant ones, but it does not fail to create a spectacle of true love. Is your lover an avid bookworm or does she happen to be reading a good novel at the moment? 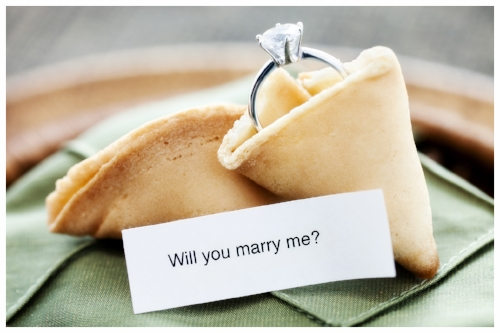 Then this would arguably be the most creative and intimate way to propose. You can replace her bookmark with a little note saying “marry me?” or possibly a love riddle or poem that’ll have her melting with emotions. You can also slip it inside a few pages after and then prepare the ring. While she’s lost in her book, she’ll be in for the ultimate page turner. A proposal by a bridge is a simple yet beautiful way to profess your unconditional love. 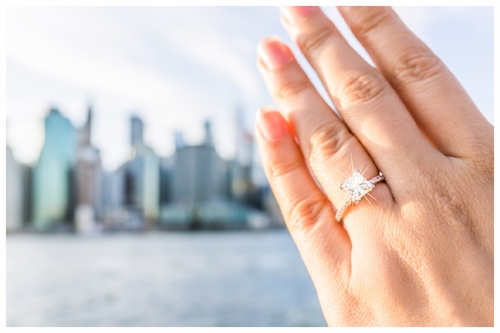 Many couples have favored Dumbo, Brooklyn because of the iconic Brooklyn Bridge view and there are also many professional photographers in the area offering specific deals to capture the precious moment. One really fun and unique way is to propose with a coffee mug that has the big question written as a hidden message at the bottom. Pour your partner her favorite drink and there’s no doubt she will be touched by this romantically creative surprise waiting at the end of her last sip! There are many mugs you can buy that are specially made for this type of proposal, such as on Etsy.com. 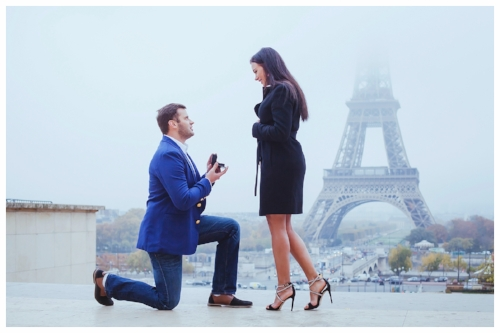 For another scenic proposal idea, the best one may be done at an observation deck, such as The Top of the Rock. Having the backdrop of the Empire State Building and the rest of the city skyline will be sure to create a picture-perfect moment. And it would be even better if you both had already planned such a trip in advance so she won’t see it coming. For those of you that want to take the extra dive, spend your day at the aquarium with your significant other and propose in front of a beautiful ocean-blue backdrop. Some aquariums actually offer proposal packages, so you can arrange a scuba diver to hold up a “Will You Marry Me?” sign in a fish tank exhibit you plan to kneel by and stage a one-of-a-kind underwater proposal that she’ll least expect but never forget. You might’ve heard of people hiding the ring inside a fortune cookie or customizing the fortune into a proposal, but you might also wonder how does that even work. There are actually many easy DIY recipes on how to make your own fortune cookie that only require a few basic ingredients and won’t take long to bake. Are you both photogenic? Have a photo booth proposal to capture the precious moment and expression on your girlfriend’s face. This is probably the most simple yet thoughtful way since you won’t need an undercover photographer (or friend) to capture it for you. Popping the big question may call for you to get your creative juices flowing, but it doesn’t always have to be like a movie scene either. Nor does it need you to reach for your wallet and hire a third party. All couples and their relationships are unique, so there really is no single best way to propose as long as you do it in a way she would feel most comfortable. Not to mention, proposals should be more personal than anything. Whether or not it is between just the two of you or in front of a filming/picture-taking crowd is entirely up to your partner’s tastes and what you know will give her a moment to remember and cherish forever.